Functions of the Heart, Lungs and Blood Vessels – Cardiovascular Associates, P.C. Arterial blood (red, oxygen-rich blood) flows from the heart to each part of the body to provide oxygen and nutrients. The venous blood (blue, oxygen-poor blood) returns from the body to the heart. The blood then travels through the lungs to exchange carbon dioxide for new oxygen. The heart is a pump which moves the blood. The arteries and veins are the pipes through which the blood flows. The lungs provide a place to exchange carbon dioxide for oxygen. The heart is a hollow, muscular organ which functions as a pump for the movement of blood through the body. The flow of blood through the four chambers of the heart is regulated by valves.The heart valves function like one-way doors which allow blood flow through in the forward direction but prevent the backward flow of blood. Venous blood returns from the body to the right side of the heart which pumps the blood to the lungs. The oxygen-rich blood returns from the lungs to the left side of the heart. The left side of the heart pumps blood to the entire body. As you would expect, the left side of the heart must generate a much greater pressure to pump the blood to the body. On the left side the valves are called mitral and aortic valves. 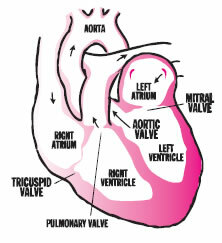 The mitral valve connects the receiving chamber from the lungs, the left atrium, with the pumping chamber, the left ventricle. The aortic valve controls the flow of blood out of the heart into the aorta, the largest artery of the body which then gives rise to all the other arteries. The first branches of the aorta are arteries to the heart muscle itself. There are two main coronary arteries: the left main (LM) and right coronary arteries (RCA). The left main coronary artery divides into two main branches: the left anterior descending (LAD), which runs down the front of the heart, and the circumflex artery (CX) which runs behind the heart. 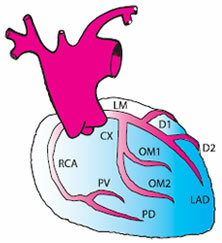 Branches of the LAD are called diagonalarteries and branches of the circumflex are called obtuse marginalarteries(OM). The right main coronary artery travels on the right side ofthe heart and gives off the posterior descending artery (PD).